Every Woman Can Be A Mogul Real Estate and Investing For Women. Ladies, if you've wondered how you could re-bound financially from divorce or loss of an income, or how you could possibly secure a more financially solvent retirement? 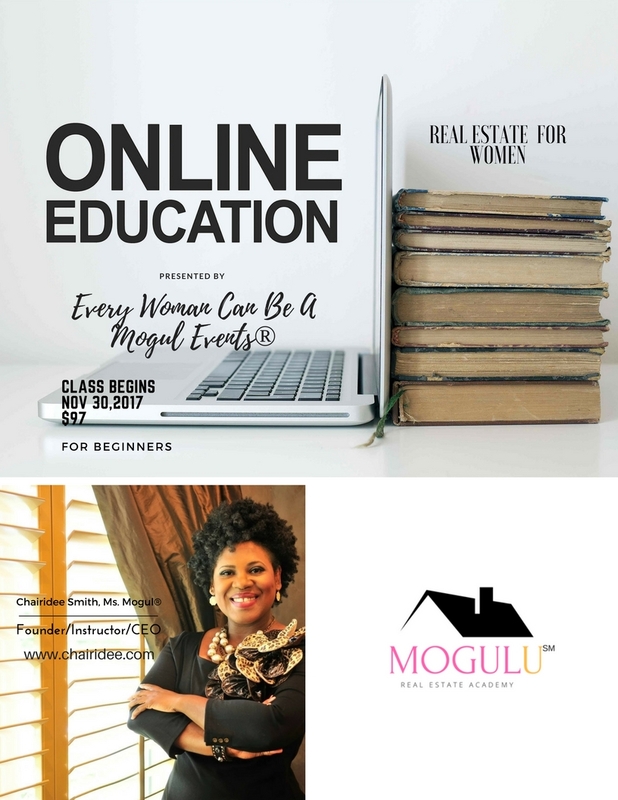 Then you must attend the Every Woman Can Be A Mogul Real Estate & Home-buying Webinar. You'll learn the investment and financial beneits of investing along with strategies you can easily employ and understand. MoguLife Real Estate and Founder Chairidee Smith are hosting an information rich webinar that puts women squarely in the drivers'seat of their financial futures. Did we tell you you'll receive an e-book for real estate beginners? So, you will not launch without a manual to walk you through your initial investing steps and the cost of all of this is pennies on the dollar!! Why? Because Ms. Mogul's® mantra is that information is the greatest equalizer and truly every woman can be a mogul. For more information regarding buying or selling your home or learning more about real estate investing for women, go to chairidee.com or call MoguLife Real Estate at 281.676.9857. Our First On-line Class Was A Success! WOOHOO!!!! The class was a success!! All spaces were filled for the first class hosted by Every Woman Can Be A Mogul® Events! Ladies from all of the city of Houston logged on for the tools and strategies necessary to secure their financial futures! The feedback was so positive and overwhelming, I'm hosting the next class, "Purchasing Tax Properties", Saturday, February 28, 2018. Registration opens soon! 2018, is the "year of the Mogul®". Join the #MoguLMovement!! Connect at www.chairidee.com! Your Home is your first "small business". Approach your purchase strategically. Become an informed CEO and drive the process. Texas is a community property state. Secure your purchase. Get prepared and know your scores. A minimum 620 score is needed to get in the game. Know HOW you're buying and WHERE you're buying. WHAT you're buying is not the only important factor. What's you're plan for the future of your home? Is this your "forever" home or do you have an exist strategy with a timeline? You have to know your temperament. Are you ready to get in the game? Define your strategy. Strategy determines location, financing, and overall process to expected end. Know when it's time to grow and diversify. (Buy and hold/flip, stock market investing, forex investing. Know the national economic climate and your local economy. LEGACY. BUILD LASTING GENERATIONAL WEALTH.